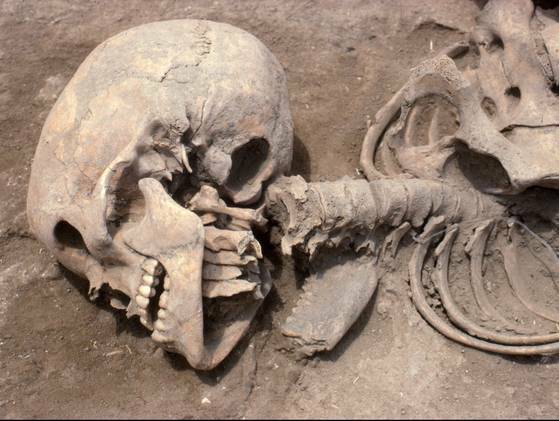 Ancient Celts practiced startling ritual murder practices, decorating sacrifice sites with ghoulish entanglements of human bones, most likely as a warning to foes and the folks they ruled. Halloween brings trick-or-treaters, candy and rather macabre displays of skeletons and graves suddenly dotting suburban lawns. All in fun, but for the ancient Celts who cooked up the autumn festival of Samhain, a predecessor to today's Halloween, a new study confirms such displays were serious business. "The ancient Celts were most definitely head-hunters," prone to displaying these trophies, says anthropologist Mary Voigt, who has long headed the Penn Museum's excavations at the storied site of Gordion in modern-day Turkey. "And they were definitely Celts at Gordion." What were those Celts (pronounced with a hard "K" sound) doing in Turkey? Well, in a forthcoming study in the Journal of Osteoarchaeology by archaeologist Page Selinsky of the University of Pennsylvania in Philadelphia, it seems they were definitely continuing some startling ritual murder practices. They decorated sacrifice sites with ghoulish entanglements of human bones, perhaps as a warning to foes and the folks they ruled. Gordion is the place where Alexander the Great famously severed the intractable "Gordian Knot," a knot so complex that legend has it that whoever undid the knot would rule all of Asia, on his conquests around 334 B.C. The death of Alexander also brought Celts, originally mercenaries and later conquerors, to Gordion, a citadel mound in central Turkey that was once ruled by the King Midas of the golden touch myth. But by 240 B.C., the time examined in Selinsky's study, Gordion was ruled by a group of Celts called the Galatians (which very roughly means the "Greek Gauls," where the Gauls were the Celtic tribes who ruled today's France in the era when ancient Rome was a rising republic). Houses and pottery, loom weights and other artifacts at the site take on Celtic appearances from that time. The other thing that takes on a Celtic appearance at the time, Selinsky reports in her study, is a graveyard. Bones and skulls from more than a dozen men, women and children arranged in odd ways appear to have been scattered around the site, in six clusters. Later Roman-era burials at the site, in contrast, are in rows of coffins and cremation urns, unlike the Galatian ones, with one exception. "Understanding what they intended is the million-dollar question in Celtic ritual practices," Selinsky says. "These are big questions of life and death and what they believed. We may be seeing several different types of rituals." In one case, a middle-aged woman's skeleton, her skull dented by three hammer blows, lay atop a younger woman's skeleton pinned under two large grinding stones. The bones of two children lay placed among them. In another, a teenager's clearly-decapitated head was arranged amid dog bones. Perhaps most bizarre, three skeletons mingled in doubled-over positions include the skull of a woman who appears to have been decapitated. Several men appear to have been decapitated among the bone clusters, their heads displayed singly in the manner of war trophies. The Celts were big fans of skulls, Voigt notes in a chapter of the bookSacred Killing: The Archaeology of Sacrifice in the Ancient Near East, edited by Anne Porter and Glenn Schwartz. The Romans noted they collected heads of enemies to hang from their horses, and they sacrificed criminals and captured enemies, using their death throes to foretell the future. "The heads of those enemies that were held in high esteem they would embalm in cedar oil and display them to their guests, and they would not think of having them ransomed even for an equal weight of gold," wrote the ancient Greek historian,Strabo. Voigt suggests that the bodies displayed by the Galatians, which would have been clearly visible to anyone living in the town below their citadel, were meant as a warning either to foes or the subject population of the town. Perhaps some were victims of ritual murder in attempts to tell the future when the Romans invaded their realm. While Selinsky is more cautious about attaching meaning to the bone displays than Voigt, her study does confirm violent death as the end for many of the skeletons, a suggestion that first made news a decade ago. "Here we see further investigation confirming a hypothesis, which is a good thing in science," Selinsky says. It's worth noting that the Galatians didn't expose everyone who died this way. One young woman found near the ritual area was buried in a wooden coffin and was wearing lion-headed gold earrings, according to Voigt. The Romans who buried people so nicely after them weren't sweethearts either; they wiped out the Galatians in a war marked by genocide around 189 B.C. As for the Halloween connection, some researchers see links, "but all we can say really is that there was a Celtic festival called Samhain in the fall when animals were slaughtered for the winter, that in some ways preceded the holiday," Voigt says. Any certainty about the deeper connection to today's trick-or-treating skeletons is as uncertain as the meaning of the curious bones left on a hillside below the ruins of Gordion.